William Morris, the son of a draper's assistant was born in 1877 in Worcester. The Morris family later moved to Cowley on the outskirts of Oxford, where William Morris started work as an employee of a local cycle firm. A few years later in 1893 he started his own cycle repair and hire business, later producing his own cycles, and then expanding his business to include a motorcycles. In 1904 William Morris set up his own Morris garage, where his interest turned to cars, and it was in 1910 that he started work on the design of his own model. He bought an ex-military academy in Cowley, which he then converted into a factory, and the production of his new car started in 1912. 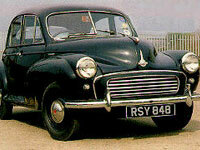 This first car was known as the Morris Oxford, and was soon to be joined by another model - the Cowley. After the First World War had ended production of these models really took off and Morris became firmly established as a car manufacturer with the company becoming Morris Motors Ltd in 1926. Throughout the next decade the company rapidly expanded, buying up other car manufacturing companies such as Wolseley in 1927 and Riley in 1938. Morris also acquired various motor component manufacturers along the way. In 1929 William Morris was made a Baronet and this was the same year that he founded the Nuffield College at Oxford. He was throughout his life to give a great deal of money to medical and educational facilities. William Morris became Baron Nuffield in 1934 and then Viscount Nuffield 1938. The Morris Group of companies became the Nuffield Organisation. During the Second World War the factory at Cowley was turned over to the production of military vehicles including tanks and aircraft while Lord Nuffield, as he was by then, served as director-general of maintenance at the Air Ministry. In 1948 the famous Morris Minor was launched at the Earls Court Motor Show, along with the new larger Oxford and Six saloons. The Morris Minor which had been designed by Alec Issigonis was to become one of Britain's best selling cars of all time. In 1952 Morris merged with Austin to become The British Motor Corporation (BMC), and many more successful Morris models were produced throughout the coming decades. William Morris died in 1963. In 1968 BMC, after merging with jaguar and the Leyland Motor Company, became the British Leyland Motor Corporation, which in turn was taken over by the Rover Group. The last car to carry the Morris badge was the Ital, which ended its production in 1984. The Morris Minor was launched at the 1948 Earls Court Motor Show where it was met with great enthusiasm from the general public and press alike. It was a completely new model designed by Alec Issigonis who later went on to design the Mini. The Morris Oxford MO was launched at the 1948 Earls Court motor show in London This was the first time that the British Motor Shown had taken place at Earls Court since it had first moved there from Olympia in 1937.